"Maybe I should have stayed home and attended the conference in Second Life. At least then I could fall asleep in privacy." There's nothing the Rat resents more than air travel. Being somewhat of a control freak, the idea of handing over his destiny to the unpredictable forces of nature, corporate conniving and bureaucracy make the whiskered one a very cranky passenger. As it turned out, the metaphorical chambers did not spin in the whiskered one's favor that night, as his flight out of Dulles International Airport in Virginia was canceled, and Delta somehow still managed to lose his luggage. A long drive to BWI Airport near Baltimore and several hours of banging his head against the ticket counter later, the Rat was close to having himself sent Priority Mail to Orlando. But he finally got on a plane, and after three more hours waiting for de-icing, he was on his way. He arrived just in time for the keynote, smelling just as you'd expect day-old rat to smell ... but at least that meant people gave him plenty of elbow room. That's right'IBM ran a virtual version of Lotusphere in the virtual world of Second Life, where it threw attendees into the deep end as part of its attempt to transform the Lotus brand into something new, cool and 'Web 2.0'-friendly. In a virtual version of the Disneyworld Dolphin Hotel, IBM allowed those who couldn't get in the doors in Orlando to view the general session online, and network with experts and attendees. Lotus officials also showed off some of the new capabilities of its SameTime instant-messaging client'including video chat and integration with telephony systems to create conference calls from IM chats. 'We need to make (collaboration tools) cool so that they will be embraced in the workplace,' Michael Rodin, the general manager of IBM Lotus, said during his keynote (and on the Second Life broadcast). Of course, all of these things depend on IBM driving the upgrade cycle of Notes and Domino. But with all of that promised collaborative mojo, the Rat left Orlando wondering if Lotus' promises would finally do the one thing no software had ever done ' eliminate the need for him to get on a plane. 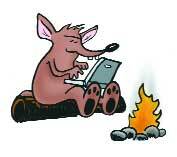 'I hope this is the last Lotusphere I ever have to go to,' the Rat grinned as he left a session on Sametime. Of course, if Lotus doesn't deliver on the promises, it might be the last one anyway.